Whole Foods Market cofounder John Mackey and professor and Conscious Capitalism, Inc. cofounder Raj Sisodia argue that both business and capitalism are inherently good, and they use some of today's best-known and most successful companies to illustrate their point. From Southwest Airlines, UPS, and Tata to Costco, Panera, Google, the Container Store, and Amazon, today's organizations are creating value for all stakeholders--including customers, employees, suppliers, investors, society, and the environment. Read this book and you'll better understand how four specific tenets--higher purpose, stakeholder integration, conscious leadership, and conscious culture and management--can help build strong businesses, move capitalism closer to its highest potential, and foster a more positive environment for all of us. 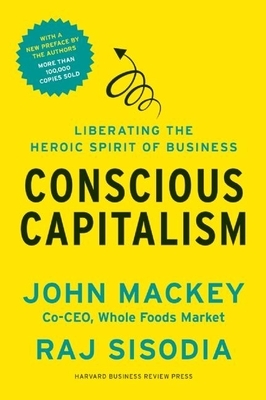 John Mackey is co-CEO and cofounder of Whole Foods Market and cofounder of the nonprofit Conscious Capitalism, Inc. He has devoted his life to selling natural and organic foods and to building a better business model. Dr. Rajendra (Raj) Sisodia is cofounder and trustee of Conscious Capitalism, Inc. and professor of marketing at Bentley University. He has authored seven books, including Firms of Endearment.